Hey folks, hope you are doing well because my last two months was very interesting, challenging and frustrating. Hopefully, you remember the article I have published about file server migration if not, let me show it to you again if you don’t mind. – In that article, you can get the essential points you should check when we file server migration. I guess you have known about the path limitation which is only 260 characters in full path, this limit oppressive many IT guys, you can create folders with up to 260-character full path. My customers have thousands of files that exceed Windows limitation which is 260 characters (full path), this issue makes us many problems, the old storage was based NAS and as you already know in NAS/NFS there are no such limits, that is why it worked for him and they weren’t experiencing any issue. The script could be very simple, like “go over all the files/folders and if fount “path length more than 260 characters so re-name them up to 260 characters(Full Path).This action would be not good enough for the customers, he has more than 1000 users who have many shortcuts on their desktop, changing paths would be breaking the network path, along with that I had concern and indecisive with regards to what will happen to the folders that contain folder which already passed the 260 full path…? does script delete the folder?’ I don’t know, although it depends on the script, you could exclude folder type as well. This action wouldn’t be good enough for the customer, he has more than 1000 users who have many shortcuts on their desktop, changing paths would be breaking the network path, along with that I had concern and indecisive with regards to what will happen to the folders that contain folder which already passed the 260 full path…? does script delete the folder?’ I don’t know, although it depends on the script, you could exclude folder type as well. Challenge – what should I say to the customer? get started, let’s re-naming longest files by telling your Help Desk team to take it as a project and perform manual work, otherwise, we could install “Free NAS“ or just installing Linux machine and connect the machine to the Active Directory using LDAP. Thereby, it was challenging for me, finding any solution, whether is bypass the limit or install third-party software, the customer doesn’t care what solution is, (maybe he does). As you can imagine the situation especially after you already have purchased storage and invested money, it is more complicated to get it back. Frustrating, oh damn! it’s freaked me out! I open a case to Microsoft PFE in order to get advice, workaround, solution, something that can direct me! Usually, when we got such an official answer we might give up and carry on to additional solution, stopping with irrelevant troubleshooting, just attach that email to the customer with a formal answer which explains to him that it doesn’t work and it won’t work and apparently he has to accept it moreover consider my other suggestions as I described above. 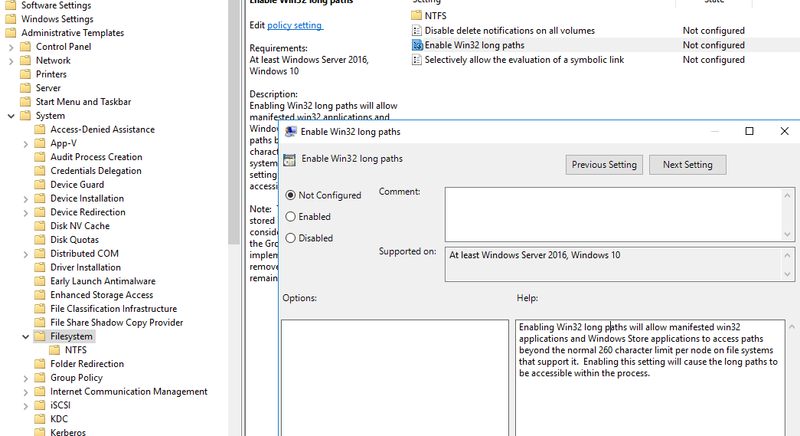 In Windows Server 2016 and Windows 10 1607, there is a new GPO feature “Enable Wind32 Long Paths”, which definitely can help us to solve this issue. Enabling Win32 long paths will allow manifested win32 applications and Windows Store applications to access paths beyond the normal 260 character limit per node on file systems that support it. Enabling this setting will cause the long paths to be accessible within the process. I enabled the policy and it still didn’t work, does not matter what I tried, Either Window 10 or Windows Server 2016. As soon as we get to “ISRAELLLLLLLLLLLLLLLL” folder and then tried to create another one and the got a POPUP, OPS…(too long), I can’t create a folder because of it’s too long, so I opened PowerShell Windows and from there I was able creating two more items, the first one is  “test123456789” folder, get into “test123456789\” [the second ] created a new notepad and called  “Pelegit.txt” which is a normal notepad file, while tried to open “test123456789” folder just for opening /viewing the “txt” file I just blocked by windows and didn’t let me go into the folder, so it turns out that using PowerShell I can create folders, files I would want, but while opening it with Windows Explorer, it doesn’t open. After several days of going down deeply, the Reduxio engineer guys found a solution, Reduxio is new a STORAGE brand that recently extremely increased the number of their customers worldwide. They opened “Wireshark” and found that the old storage presents “Short Name” value, the old storage presents us that value and on the Windows side there’s nothing which specifies that. Then I went into the folder and creating several folders just to reach to the 260-full path . What will be the output on Wireshark right now? As you can see we got “Short Name length:16” which means that now it works and available for clients. Those who are wondering how does it behaviors on Windows Clients, just reassuring you it works from any Windows machine. Well, what is 8dot3 at all? First of all, just to make you aware, Microsoft recommends disabling 8.3 because of it may decrease directory enumeration performance, to be honest with you guys, I am not so familiar with 8dot3, we are talking about very old name creation method on Windows 2000, XP, Windows NT Operation systems. At those times, I think I was playing soccer with my friend, but I did Google and then realized what it is, how does it work. 8.3 automatically generating an MS-DOS-readable (8.3) name for each file. Reduxio guys have been done a wonderful job, got into SMB protocol and provided a great solution. I would like to praise the Reduxio engineers which are truly extraordinary guys, I have been working with them for several months since the first acquaintance I noticed that they are highly professional guys. That’s is very interesting, I had the same case 4 years ago when I replaced my storage. However, has few files with long path experienced. In my case, i change them manually. Thanks for sharing Meir Peleg, and well-done guys from Reduxio! Good to know!, Microsoft with stupid limitation which is always in crucial parts! There are benefits to leaving 8.3 naming enabled. It makes it a lot easier to cope with files with illegal characters. If you have Mac users on your network, Macs do not enforce the SMB file naming restrictions. They expect the server to do that. Windows server expects the client to do that. As a result, I get a lot of illegal file and folder names littering my network. There are two ways to deal with this from the command line. The easy way is to rename the files or folders using the 8.3 name, which automagically generates without illegal characters. 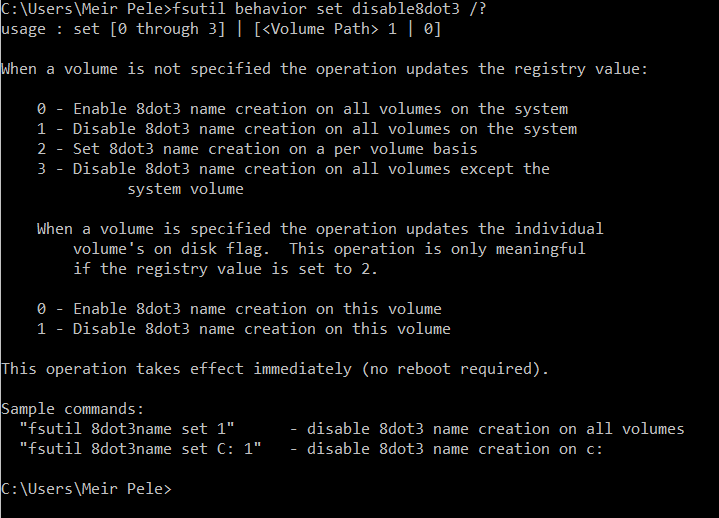 So a simple command – RENAME 8dot3.ext LegalName.ext – fixes anything. Without 8.3 naming, I have to use UNC paths. So it’s more like – RENAME “\\?\[drive letter]:\folder\folder\illegal name” “legal name”. That works fine for files, but not folders. The RENAME command parses the path entered, interprets the “?” as a wild card, and will not rename a folder. Instead, I have to use work arounds, like third party applications or copying the data to a new, legally named folder and deleting the old folder.